Thanks for helping us replace our gym floor this year! Where children explore, parents participate, and teachers nurture. If you are looking for a supportive school community that will partner with you in the nurture and guidance of your child, we invite you to come and get to know us at HMS! It is our mission to not only provide a quality education but also to help your children discover and develop their God-given gifts and appreciate the community around them. Come see and experience a school environment where children and teachers alike get excited about learning and exploring together what it means to live God’s purposes for their lives! VISIT US during one of our upcoming Open House Days for Prospective Families and experience HMS for yourself! Thanks for helping us schedule a new gym floor this summer! 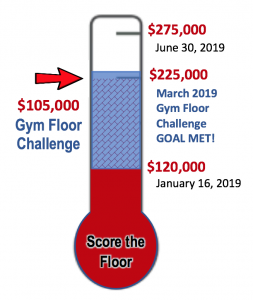 We are now at $228,000 toward our total $275,000 goal for finishing the rest of our gym wing renovations and modular classroom addition. Our hope is to finish these projects and fundraising by June 30. DONATE HERE and help us meet our goal! Core Values Student Life Visit Us!